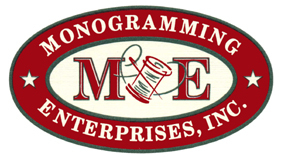 Monogramming Enterprises, Inc. has been in business since 1985 providing the very best embroidery and monogramming services on a variety of apparel and promotional materials for local and regional businesses and community organizations. Our specialty is providing custom embroidery and screen printed apparel including: jackets, hats, shirts, sweatshirts, tee shirts, bags, and more. We represent and provide branded products to the promotional products and advertising materials industry. Items we monogram include: pens, stickers, magnets, glassware, mugs, key chains, clocks, apparel, and other accessories.